mean ol' meany: Fire Croom NOW!!!!! 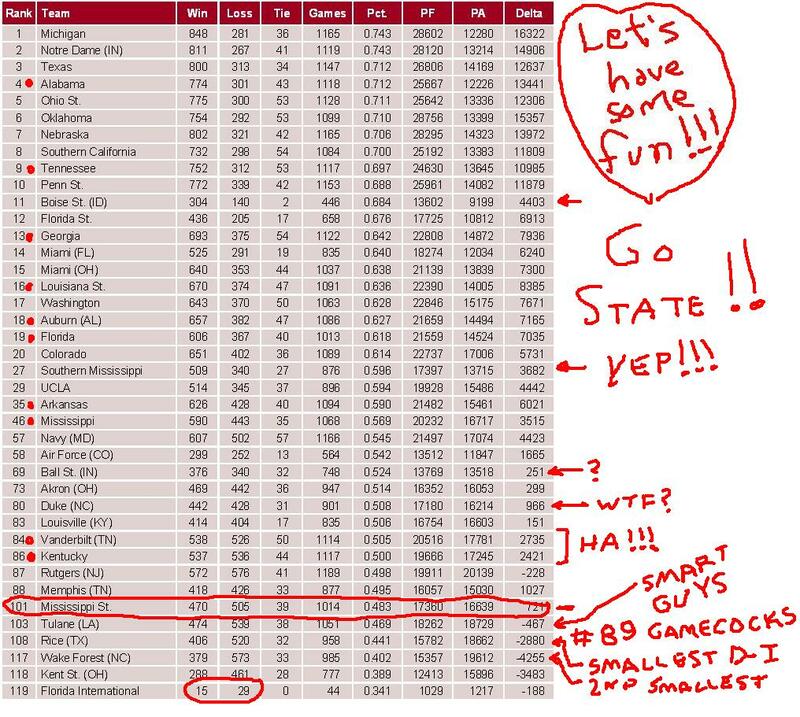 While doing cursory searches for my buddy Shane on some college football stats, I stumbled upon this gem for you State fans. What you see here is the historical record of Division I-A College Football ranked in winning percentage. Marked with the red dot by the ranking, you will see all of the SEC teams, except for the South Carolina Gamecocks that I inadvertently clipped. They are ranked number 89 anyway. Mississippi State has the lowest winning percentage of ALL of the SEC. They are historically the worst team in the conference. 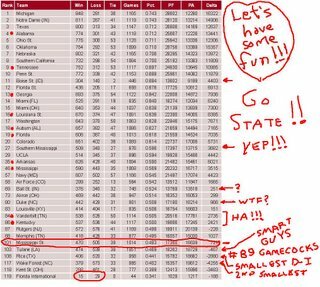 Also, you will see that the only team that has over 1000 games logged that has a worse winning percentage than State is Tulane, who incidentally beat MSU this year. And further insult to injury comes from the fact that DUKE!!! has a better winning percentage than State. DUKE!!!! You will notice as well that the lowest winning percentage in all of Division I-A ball is held by the juggernaut of Florida International who just lost 18 of their players in the brawl with Miami (Florida). Anyhoo, firing Croom is the dumbest thing that State could do. They ought to sign him to a forty-five year contract and see what some stability could do for the program. Oh, and you will also notice that of the D-IA schools in our state, University of Southern Mississippi is 27 out of 119, Ole Miss is 46, and State is 101 of 119. FOR CRYING OUT LOUD, LEAVE CROOM ALONE, YOU STUPID NO-FOOTBALL KNOWING STUPID DUMMIES!